Faber-Castell Design Memory Craft is teaming up with Perfect Layers for a blog hop! Faber-Castell Design Memory Craft will be giving away $50 in prizes and Perfect Layers will be giving away 3 Perfect Layers Rulers! You have until midnight EST, on April 5th to complete the hop. Just follow the links below- be sure to leave a comment on each post. That way, we’ll know you were there. Happy hopping! Here is my project using the Perfect Layers tools. 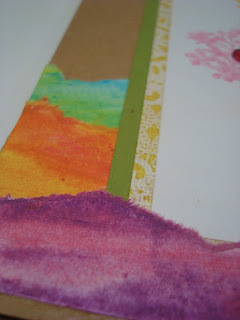 I used the Perfect Tears deckle tool to create the edging on the colored pieces. Then I used the Perfect Layers tool to create the matting. It made it so easy to create even edges all the way around! I used the water pen to moisten the edges of the paper around the deckle tool. It allowed me to tear it easier since I was using cardstock. I colored the strips that I tore with the Tropical Gelatos and layered them on the card. The perfect layer tool is easy to use and created even matting on all sides! Super easy! Don't for get to hop to the other blogs and leave comments! Perfect Layers also has a special discount for you- use coupon code FC5% to get 5% off your entire order! very pretty - love your color choices - thanks for explaining how the tearing works. Such a pretty card and love the wavy layers with the Perfect Layers tool!! The more I see the Perfect Layers being used, the more I know I need them! Your card is so pretty! I love what you did with the gelatos. I am fairly new to them and love seeing all the different things I can do with them! Thanks for sharing! Love those colors girl! Fabulous! I love this card! The colors are perfect! I gotta get that stamp! pretty colors on your card. thanks for tutorial. I love the colors. I am excited to learn more about perfect layers. TFS! Great card! The torn layers really popped the matting. Love the colors! Love that torn paper look and the beautiful colors on this card! Beautiful colors on this pretty card! Great colors and the ruler looks like a great tool, too. I like the vibrant colors you use! They really make the card pop. Lovely card! Thanks for the tip about using the water pen before tearing. Great idea, I never thought about that. Thanks also for the chance to win. I LOVE the colors you chose for the flowers. I also love how you made the ENTIRE FLOWER those colors. My name/ID will show up on this blog as Colorado Crafter but will show up as "CC" on some of the other blogs in this hop. I have never seen the Perfect Layers products before. Thanks for showing yet another way to use them. I love your beautiful card! Great tip for use of water with the deckle ruler. Love all the bright colors, they sing spring. Thanks for a chance to win such great products. Those are some great colors. I like how you made the layers, too. Wonderful card! Love the bright, beautiful colors! Beautiful card! I love your use of the gelatos! Thanks for sharing! Pretty, pretty colors. Just learning to use Gelatos. Only have a couple sets. Hope to try the water color pencils as well as the rulers. Thanks for the tip about using water to make the tearing easier. I love how this turned out. I love what you did with the layering can't wait to use it in some of my projects. Thanks for sharing. Beautiful card, so springy. I love the added texture to card with the perfect tear ruler. Love the torn strips done with the Perfect Tears ruler. Great colors from the Gelatos! Very pretty card! Love the floral image too! What a beautiful spring-y card! Oh, I love the tropical colors. Guess I'll have to get them! Love the colors! great work. Gorgeous gelato colors. I love all the layers. So cheery. I hadn't thought about using the rulers as a guide for the coloring. I have them on my "must have" list. Love the card. Great job. Wow! You have a gorgeous blog! I am now following it. I need to get the ruler for my craft room as I need something to help me tear straight-uneven lines..did that make since? ha ha..only would make since to a crafter! Lovely, lovely card. Loved the colored pearl embellishment for the center of the flowers. Thanks for the tip about moistening the cardstock before tearing. so pretty!! thanks for the inspirationa! I love your card! The flowers are beautiful and I love how you used the ruler. Your colour choices and layering are amazing! Oh I love your card. And the tip with the water on the paper before you tear it. I have some of the rulers but not those. Thanks for the chance to win. Linda K.
GREAT idea on the water pen to make it easier to tear. Very pretty--I like the torn and tropical colored layers. These are bright and cheerful colored layers and flowers! I love the tropical gelato colors you used and the way you blended them. Very inspiring! Fabulous! Thanks for the edge tearing tip. So very neat and unusual. Thanks. love all of the bright sping colors. cute card. Very lovely card! Love the bright colors you used. Lovely card and thanks for the great tips on creating it! What a beautiful card! Loved the coloring and the layered strips! Your card is very pretty. The photos show just what we need to see of the techniques & products. Great gelato coloring, too! 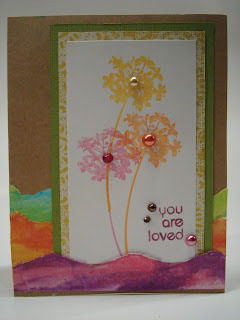 Gorgeous card, like the water color look of the flowers and the layers of paper, rock!! Thanks for the chance! Loving the gelato colors and the effects of the Perfect Tools you used. Thank you for giving us the chance to win!!! Beautiful card! Love the tropical colors and the torn layers! Pretty , pretty card. I think I need the Perfect Tears Rulers! Great card. Great directions. Great accompanying photos. I love your deckle flower card. So cheery! The great directions with pictures is so helpful. Thanks so much. The tiers of color on your card is great. Am loving the revisiting of the tearing technique. Those tearing rulers are awesome. I've just bought some gelatos - looking at your card has given me motivation to use them! I love the Perfect Layers tool. Jennifer - Love your card it is awesome - the colors are just beautiful. Thanks for the tip about the water pen. The Gelatos are great - wonderful blending. Wonderful card! Love the colors and torn layers. Looks like a great tool! I love your torn layers!! Wonderful card. Thanks for sharing. These colors look pretty together! Love the wave effect and the stamping. And those tools look fabulous. I love your work. I learn all the time. Thanks. Love all of the color-great layering!